As your church considers the myriad of worthy causes to support this Advent season (or even Thanksgiving! ), here are four Alliance initiatives (three from our own Alliance Northwest Field, and one National) that could have dramatic impacts on the ability of our international workers to spread the gospel. Phil and JJ, Alliance Northwest international workers, are a part of the Teahouse team that launched in 2011. You can read some recent news about the team here. The team has now branched into a second city, with an even bigger lack of Christian witness, and plans to setup programs addressing health and wellness education, strong families, and professional development. Your gifts would help offset Teahouse’s yearly operating budget of $70,000 ($35,000 per city). Cascadia Network currently partners with them. Alliance Northwest international worker Debbie Vik works closely with The Center for Leadership Development (CLD), a Bible school program developing lay leaders from tiny churches with little access to resources to become more effective in church ministry. The three-year program includes theology, ministry skills, and personal skills. Graduates from the program are able to preach, teach, lead ministries, and plant churches. CLD holds a camp once every three years for students and their pastors as a way to encourage them, access further skill development, and allow them to meet other people studying in the program. The next camp is scheduled for October 23-25, 2019 in Khon Kaen, Thailand. Many will find it financially difficult to attend, and a partial scholarship of $50/person would be a great encouragement. Debbie and her team hope that about 100 people will be able to attend. Southeast Alaska and North Puget Networks currently partner with Debbie Vik. To support this project, use this link for Debbie’s work fund. Only a handful of people follow Jesus in Gjilan, Kosovo, a city of over 90k. An Alliance team supported by Alliance Northwest churches is firmly embedded there. The opening of their new community center will greatly enhance their ability to speak the name of Christ into this corner of the world. Many areas of the community center still remain to be completed. 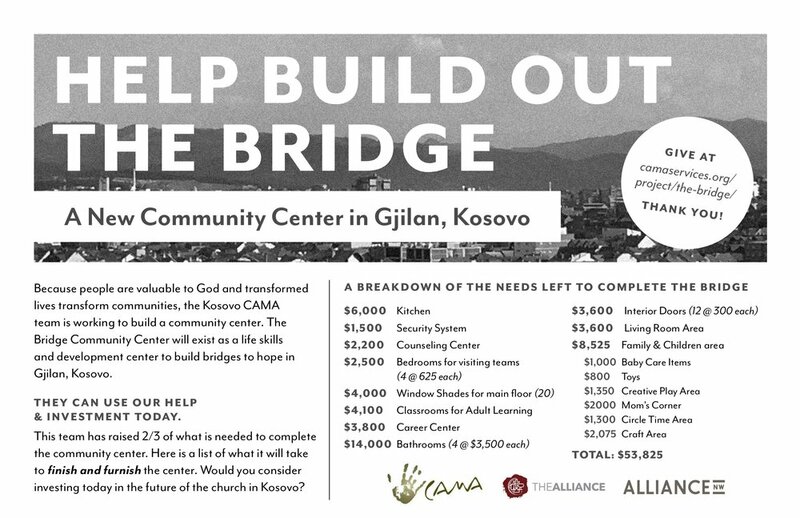 Find out more by reading this flyer; your church’s investment in this center can be sent to: camaservices.org/project/the-bridge. The Portland Metro Network currently partners with the Kosovo team. This year, 60 new positions have opened for passionate, well-equipped new workers to serve as clergy, vocational, and community development workers in some of the world’s most spiritually desolate places. Our gifts to this offering will place more workers among people who desperately need the redemption and restoration only Jesus can offer. Gifts to the Alliance Year-End Offering will help send new workers through the Great Commission Fund (GCF), which fully or partially supports and equips 700 Alliance international workers, and the CAMA Advance Fund, which enables 40 community development workers to show Christ’s love to afflicted and neglected people in war-torn and disaster-stricken areas. Keep an eye out for more information on the 2018 giving project at cmalliance.org as it is updated. After years of persecution by the Bobo-Mandare villagers, Kevin and Bonnie Oberg (Dallas Alliance Church; Dallas, Oregon) and their Fo Alliance Church members can now see a change in how their neighbors respond to the gospel. Many in their community have come to know Christ. The church has helped plant churches amongst multiple unreached people groups. And they have their first home-grown pastoral candidate, now in his second year of studies. Alliance Northwest sends and partners with International Workers around the world. For more information, or to schedule an IW on tour in the US to visit your church, click here. An Alliance Northwest Global Mission is seeking to finish their community center building project. 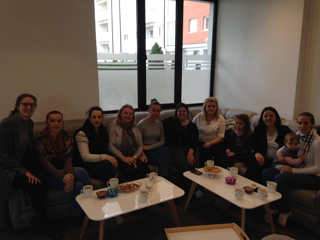 Only a handful of people follow Jesus in Gjilan, Kosovo, but an Alliance team supported by Alliance Northwest churches is firmly embedded there. The opening of their new community center will greatly enhance their ability to speak the name of Christ into this corner of the world. Would you consider challenging your congregation to take on one of the below projects to complete the buildout? You'll see that there are a variety of needs and investment levels that still remain to be addressed. Your investment in this center can be sent to: camaservices.org/project/the-bridge. Also, feel free to download and disseminate the "Help Build Out the Bridge" image above. Thanks for wanting to be on mission together as family in the Northwest and in Kosovo! You’ve likely heard that the Alliance is changing the way in which churches schedule visits from international workers on tour. Now, instead of individual churches contacting international workers, churches will work through the Field Office to schedule them. We will continue to publish touring Alliance Northwest international workers; however, instead of publishing quarterly, we will be able to share who is home (and when) in 12 month increments, starting in March ’18 for the period of June ’18 – June ‘19. Occasionally there will be others added throughout the year, and we’ll publish them as their schedules become available. Alliance Northwest churches will have exclusive access to schedule workers from our Field during the period of April 2-15. After April 15th, their available dates will be open to all of the Districts in the country. Because of this, it’s going to be important to think ahead and book them early. If you want to schedule someone from the Alliance Northwest, please contact Kristy between April 2-15 to let her know who and when you would like them. You can always contact us after this period, but there isn’t a guarantee that the international worker you want will be available. Look for more information on this in coming months, along with the updated tour schedule in March. For the current tour schedule, click here.